Information: This new Small Web Solutions client wanted to update it’s online look and functions with a rich, colorful and device-responsive format, as well as to offer some online purchasing options. The existing site was a cookie-cutter design using GoDaddy design tools and presented an outdated, unprofessional look and format. Small Web Solutions made a number of suggestions, including the development of a user-friendly layout and navigation style that neatly presents the stunningly beautiful products this family business has to offer. Site Features: This is a fully integrated custom WordPress website that uses WP as a content management system for all site pages and news feed articles. This allows the client to edit page content at-will and to keep the site current with updates about products and services. This particular WP theme also uses modules that allow for easy drag-and-drop positioning and editing. WP plug-ins include the ability to manage meta tags for search engine optimization, and to upload photos and documents. Included in the back-end administration of the site are tools for ecommerce and third-party email marketing. 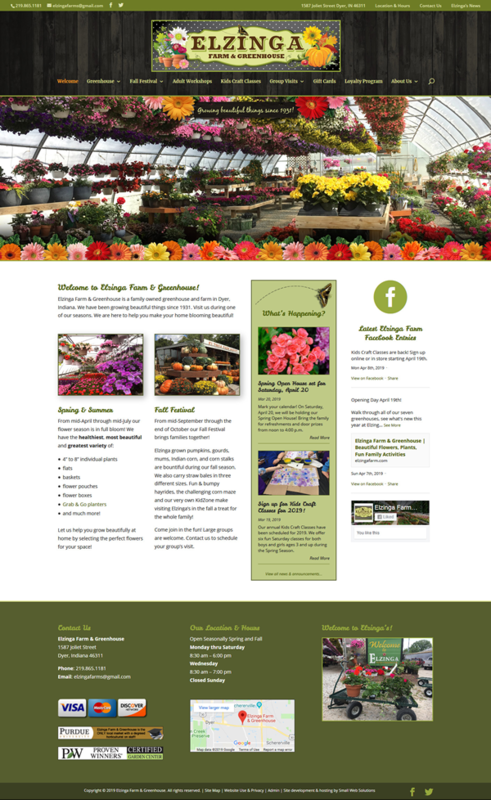 Design Features: Home page slideshow with seasonal custom static border, stylized sub-page headers, submission forms with email notification, social networking links and embedded Facebook feed, integrated Google Analytics tracking, automatic copyright updating, favorites icon, masked email to combat auto spam. Information: This long-time client of Small Web Solutions recently (2018) wanted to update it’s online look and functions, as well as to increase the company’s SEO rankings with a truly device-specific responsive format. 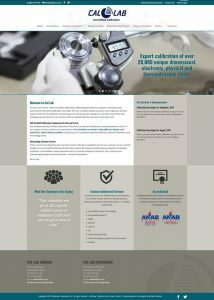 While the existing site — redesigned by SWS in 2011 — was getting the job done for its clients, Cal Lab’s focus on customer service was the driver for making its site truly client-friendly. Small Web Solutions made a number of well-received suggestions, developing a strong and easy-to-use online presence for Cal Lab, while at the same time retaining the original essence of the website to let Cal Lab clients know they are interacting with the same business they know and trust. Site Features: This is a fully integrated custom WordPress website that uses WP as a content management system for all site pages and news feed articles. This allows the client to edit page content at-will. This particular WP theme also uses modules that allow for easy drag-and-drop positioning and editing. WP plug-ins include custom forms and results database (public and private), the ability to manage meta tags for search engine optimization, and upload photos and documents. Design Features: Home page slideshow, stylized sub-page headers, client login, multiple submission forms with email notification & database backup, social networking links, integrated Google Analytics tracking, automatic copyright updating, favorites icon, masked email to combat auto spam. We added a new customer yesterday. I asked them how they found out about us and they indicated they did a Google search for calibration. When they found our website they said they were extremely impressed with the professional look and layout. They said it was a factor in determining which calibration company they were going to interview. They are going to be Cal Lab’s largest account! Information: Eleni’s Modern Mediterranean is a division of a long-timeChicago wholesale food manufacturer that is looking to expand its horizons into the vegan and non-meat market. Our goal was to present their new food offerings in a colorful and enticing way with rich photos and an intuitive layout. A great amount of information is displayed on the site and our job was to organize and feature it in a user-friendly way to encourage new leads and recurring sales. Site Features: Single page WordPress website with anchored menu to various sections on the page. 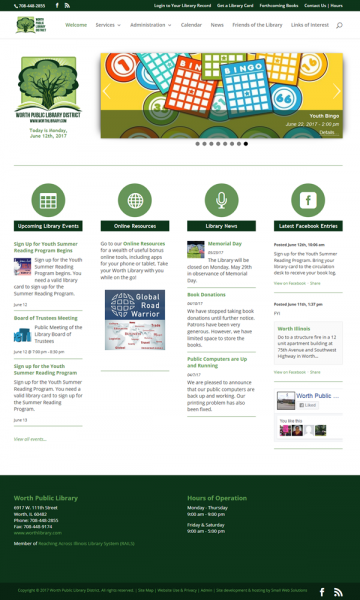 This site has a modern, responsive layout that responds to all types of viewing devices, including smart phones. Design Features: The use of full, attractive photos within the layout with parallax effects makes this site a cutting edge representation for the company. Two forms are located on this single page, one for more information about the company’s products and another to join a mailing list for recipes and product news. Also, an attractive product photo gallery highlights the company’s wide variety of consumer product offerings. 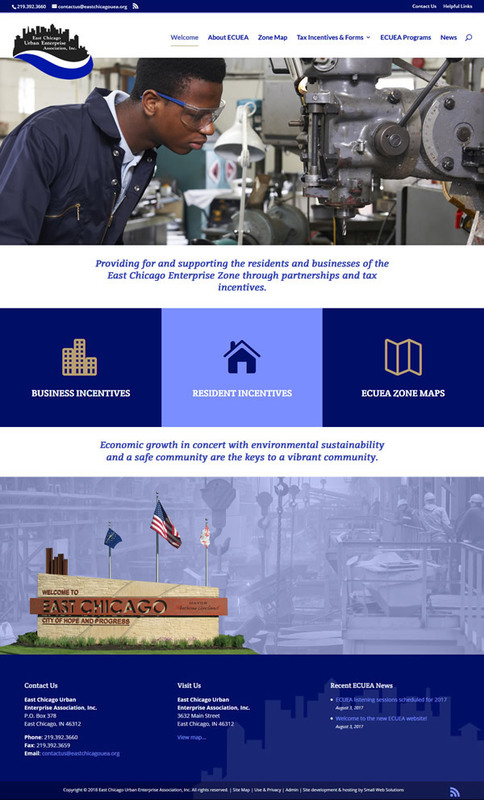 East Chicago Urban Enterprise Association, Inc.
Site Features: Fully integrated custom WordPress website that uses WP as a content management system for all site pages. This allows the client to edit page content at-will. WP plug-ins include a fully customizable events calendar, a user-friendly, sortable resources module, collapsing modules with large amounts of linked data, the ability to manage meta tags for search engine optimization and upload photos and documents. A later addition to this website also included a custom Careers page with online job applications. Design Features: Home page features a slideshow incorporating the library’s upcoming events, as well as a news feed and social media feed. Subpage & global features: tabbed sections for easy viewing of multiple categories of data, random header delivery of patient/client testimonials, integrated Google Analytics tracking, global & single page SEO customization, site search functions, automatic copyright updating, masked email to combat autobot spam.